Get a jump on the Christmas Holiday season by having all the little things addressed early. Too often we leave those small decorative items we've always wanted until the last minute then think, 'nah', maybe next year. Don't do that this year. Life is short. Chair covers make a lovely addition to a Christmas table setting; when you're aiming for a red-green table setting, they complete the festive look and feel. They're not a one trick pony: Chair covers can also be used for home Christmas parties or even holiday birthdays. 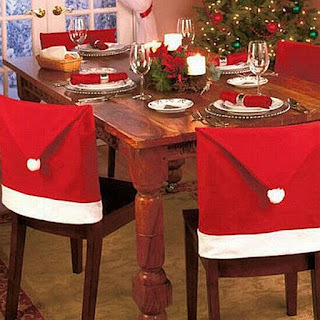 Featured in the photo are a set of 8 Santa Claus Hat Chair Covers. You'll be surprised by how affordable they are. Get a jump on your holiday plans. Generally you'll want to allow 3 to 7 days for order processing and 2 to 8 days for shipping. Start today and you'll have plenty of time. 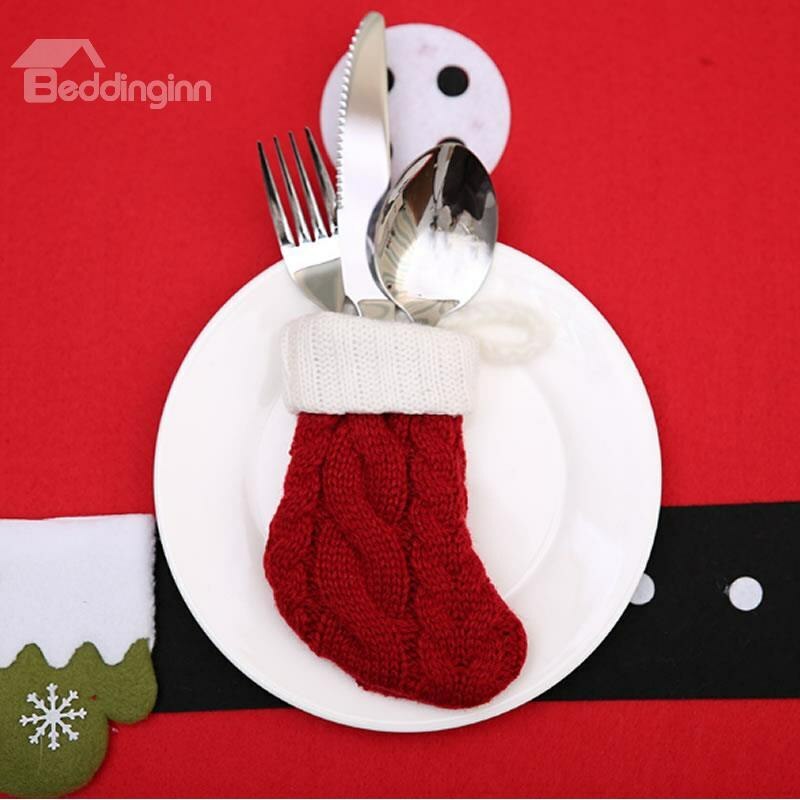 Imagine each place setting graced with a funky Christmas stocking stuffed with silverware. When you visit the link on the featured photo you'll see that two stocking sets are included. They indicate that a knife and fork and stocking come with each one. Although the photo does show a spoon, the description doesn't mention one. Also, you can easily DIY this idea. Simply use a small stocking from other décor items you've collected, or make them. Place your silverware inside and you're done. Use this idea to hold dinner cutlery for buffets. Place your silverware inside and tie a Christmas ribbon around it if the stocking is too loose to keep it held in place. Display them on your buffet to enhance your holiday presentation. 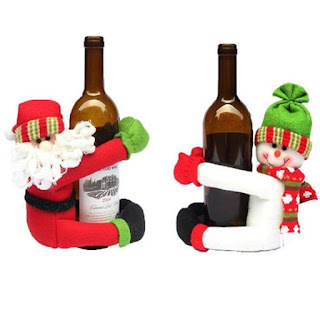 Accessorize the table with these funky Santa and Snowman wine bottle sleeves. Place them anywhere the wine is on display. Use them and re-use them as need be during the holiday season; they'll add whimsy to your holiday party. Give them out as a Hostess or holiday gifts. When bagging or wrapping a bottle of wine isn't your thing, these decorations do the job. If you're hosting a non-alcoholic dinner, place these around other bottles on the table, and when dinner is done, hand them out to the kids. Theses type of accessories serve multiple purposes. Collect a variety of whimsical decorations so they're handy for additional table décor, or to have available as occasional gifts to hand out during the holidays. Note that when you visit the link under the photo, additional information will be provided, including the price. These wine bottle sleeves don't come as a pair, you'll have to order each separately. Get planning, the Holidays are around the corner - beat the rush this year! Great holiday decorations on a small budget. Those chair covers make the house festive without another thing, for sure! Great article, thanks for sharing. Great accessories for the Christmas dinner table. I love the chair covers and especially the wine holders!!! The wine holders are such a cute idea. Gives an instant holiday presence to a buffet table display or just as a holiday decoration all season long. Thanks for the clever ideas. I have a couple of those snowman wine bottle holders. They are a great decorating idea. Really pretty ideas! I couldn't help but think how I could do the silverware stockings in advance and I wouldn't have to worry if I properly set the table either. I also like the idea of the decorative chair covers. They are pretty, but also help protect the wood backs on the chairs. Love all of these very do-able decorating ideas. If I start early enough I should be able to enjoy some of these lovely ideas. Now to get my act in gear, thanks Barbara for your help in lighting the fire under me. The perfect touch for the season. I love the wine bottle covers!! How clever is that?? Thanks Barbara. I'm not much of a holidays decorator...but I think ALL of these things are great. Love these ideas. I might have to actually decorate a bit this year.